<i>Do your children love water and swimming? Do they want to spend all day in the swimming pool? Gustocamp presents you here the campsites with the most beautiful and big aqua parks in Italy. These aqua parks offer multiple (heated) swimming pools, wave pools, water slides, jet streams, water playgrounds, hydro massage and more…. fun for children and growns-up alike! Around the swimming pools there are enough relaxing chairs and beach umbrellas to enjoy the sun or just to sit back and read a good book. To gain access to the aqua park you will receive a bracelet at most campsites. In general, these big aqua parks are under supervision of lifeguards, but off course, parental authority is as just as important. 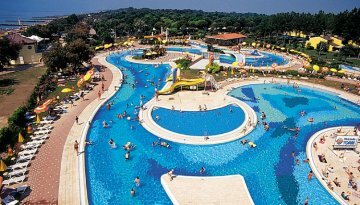 Campsite Marina di Venezia has no less than 10 swimming pools and 8 water slides. 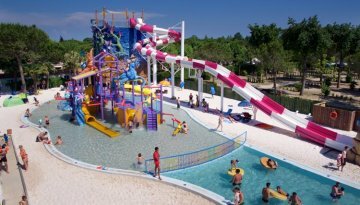 In total, the campsite offers 15000-m2 water fun for both children as adults. 3 out of 10 swimming pools are heated, so that you can swim even on the less sunnier days - from high slides (fast kamikaze, closed and open toboggan slides) to jumping between the waves in the wave pool. The Coral bay swimming pool is a heated swimming pool, especially suitable for children under the age of 5 years. The colourful swimming pool has a coral reef theme with even a Manta ray Raya. The heated lagoon swimming has 2 colourful slides and funny turtles and dolphins who spray water. Also at the fantasy castle, you can find many slides, colourful animals and surprising waterfalls. In the Sparkling pool, you can relax completely on the hydro- massage lying chairs. In addition, we can’t forget the Olympic swimming pool with its 3 lanes reserved for swimming laps and the 16 water jets for a nice cervical massage. Campsite Pra’ delle Torri is well known in Italy because of its spectacular swim paradise. Pra’ delle Torri offers in total 4000-m2 of water fun. 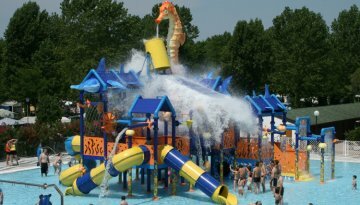 Often the aqua park opens mid-May and closes mid-September. During pre-season and late season, both the Olympic and semi Olympic swimming pools are open; these pools are indoor during that period. Slides and waterfalls can be found all over de aqua Park where children can enjoy themselves at the different water playgrounds. Next to the swimming pools, there are some restaurants and bars for a drink or food. 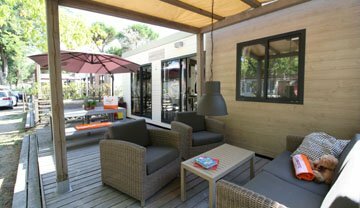 Campsite Union Lido has 2 aqua parks, namely Aqua park Laguna and Aqua park Marino. Aqua park Laguna is a unique park in Europe with over 1000- m2 (of which 2000-m2 with new attractions) white sand with palm trees. Between the rocks, you will find waterfalls, hydro massage, and waterslides for the little ones and more. The Vortex is a thrilling big water slide with strobe light effects. With a rubber boat, you go down the slide to finish spectacularly in a large impetuous vortex. And, what about the wave pool? The first swimming pool with continuous waves. Endless fun in life like waves. Aqua Park Marino is the 2nd aqua park at Campsite Union Lido. In this part of the swimming paradise, you can find a heated semi-Olympic swimming pool (25x12.5 meters), 3 big water slides, a million bubbles in the 2 heated hydro massage pools and a safe lagoon with soft edges for the younger children. As well, there is a colourful water playground with climbing and splash fun and water fountains for a quick shower. Let yourself be carried away on an inflatable tire in the flow of the ‘Easy River’. The swimming pools at Campsite Bella Italia are a real treasure for the campsite. An area for a lot of water fun and relaxation. The aqua park is open from the beginning of April to the end of September. 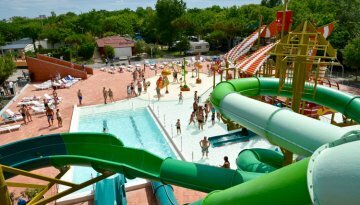 At the campsite, there are 5 swimming pools with water slides, child-friendly areas and a funny water fountains. Off course, there is also a children’s pool for the youngest children. Get a refreshing drink at the pool bar and enjoy the sunny weather at the spacious terrace with deckchairs and parasols. Discover the world of Bel Island, a fantastic water playground guaranteeing hours of water fun. Get surprised as the big water bowl overturns or join the animation team who are organising all sort of games for both children and adults. Water slides, waterfalls, water animals and many other activities to enjoy the nice and long holidays during the hottest hours of the day. Once more with a refreshing drink or ice cream of the pool bar. Do you want more water fun? Campsite Bella Italia also has a (pebbled) beach on Lake Garda. Here you can practice multiple water sports such as pedal boating, canoeing or water skiing. Campsite Spiaggia e Mare offers a big aqua park. In the centre of the campsite, there is a swimming pool with children’s area. For the youngest guests there is an oval swimming pool with a depth of 30cm. For the slightly older children there is a real pirate boat with multiple slides and other play devices. In the Lagoon swimming pool, you can take part in the aqua aerobics’ lessons. A special tower of 9.5 meters height has two more slides. These slides are only accessible for children above 1.20m height. Campsite Norcenni Girasole Club has not one, but 2 great aqua parks. All different kinds of swimming pools with deeper water for adults and shallow sections for the younger children. There are outdoor swimming pools and a heated indoor swimming pool … Guaranteed water fun for the whole family! Not to forget to mention the water slides, castles and play devices for children …pure fun! At the upper part of the campsite lies a lagoon swimming pool. In these lagoons, the water depth is only 30 cm and the bottom is made of soft rubber. A true swim paradise for your younger children! Rubber hills come out of the water like dunes, fountains spray water, and it’s splashing and playing time on these sliding hills. Children go up and down on the big red water slide, first 30 meters sliding and at the far end a big splash in the water. Go with the flow in the lazy river, a fantastic water road where you can float with your inflatable tire. Sport enthusiasts can start their day with swimming lanes in the rectangular family pool. Furthermore, the animation team organises a variety of activities in and around the swimming pools such as aqua aerobics or aqua volley. Both aqua parks have a bar where you can have breakfast, lunch and drink. If you think this is all? Campsite Norcenni Girasole Club also has a wellness centre. Unwind and get pampered in this wellness centre during your holiday. What do you think of a back, shoulder or neck massage? Or a facial treatment? Enjoy the peace in the sauna or the Turkish steam bath. 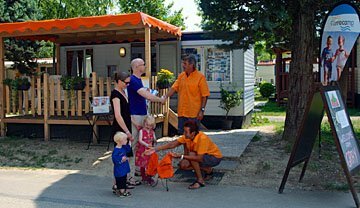 Can’t wait to go to Campsite Norcenni Girasole Club? Did you pick your favourite campsite? Gustocamp has listed the campsites with the most beautiful and spectacular aqua parks. You can be sure that your children won’t get bored for a minute during the holiday. Do you need personal advice? Please call one of our colleagues at the Gustocamp office. 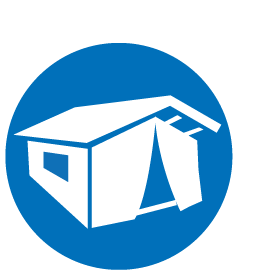 Call: telephone number +44 (0)1706438006 (Monday till Friday 9.30-17.30) or send an e-mail to info@gustocamp.it.